“Before I start I want to begin by saying that I am not here to answer questions about how much money I made and what material items I owned when I was selling drugs,” said Freeway Ricky Ross to a group of attentive youth in New Orleans. Until that moment, many of them may have only known his name by way of the Hip-Hop artists Rick Ross and Freeway. They may have only heard hints of his past life but on that day they heard from a changed man. “That part of me is dead. I am here to encourage each of you to take responsibility for your life and inspire you to be the best you. I have only been out for ninety days and within that time I have been speaking to youth all over,” said Mr. Ross. From December 28-29, the former Los Angeles drug dealer along with Brother Enoch Muhammad of Hip-Hop Detoxx addressed members of the community in the sister cities of Baton Rouge and New Orleans. 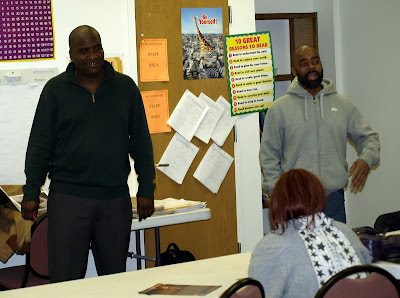 Mr. Ross and Hip-Hop Detoxx were invited to the state by Brother Arthur “Silky Slim” Reed, CEO of Stop the Killing Inc.
Mr. Ross and Brother Enoch began their work in the city of Baton Rouge on Dec. 28 by speaking in several churches and conducting interviews equipped with a message of hope, inspiration and redemption. “The condition of our community is in such a condition that we need and must use as many people we can to help win this fight for the minds of our people. I felt that with the work of Brother Enoch and those who work with him with Hip-Hop Detoxx along with Freeway Rickey Ross we could really touch the hearts and minds of many,” stated Brother Arthur, a reformed gangster who is now working to save the youth. After a full day of work in Baton Rouge, they headed to New Orleans. A classroom full of students working to attain their G.E.D.’s patiently waited for the arrival of the special guests speakers. Brother Enoch began to talk about how the same toxins that exists in Hip-Hop music today existed in the music that the studentâ€™s parents and grandparents listened to. The students listened attentively to every word spoken by Brother Enoch. Mr. Ross shared with the students how he was illiterate for much of his teenage life and what inspired him to learn to read. “One day after reflecting on some words of my attorney. I realized that no one should know more about my case than me. At that moment I decided I would learn to read. I shared my inability to read with my cellmate, who began to help me to learn how,” stated Mr. Ross. “Hearing him talk about how he has read over three hundred books and has written several screen plays and his own autobiography that will be made into a movie inspired me to want to write more,” stated Jere’lynn Griffen. Immediately after speaking with the group of students at the local G.E.D. program, Mr. Ross and Brother Enoch moved throughout the city conducting a slew of interviews. The next morning they addressed a group of youth who were incarcerated at a youth correctional center. “After speaking to the youth, I told the brothers that I wish I could remain with those youngsters for two more months. If I could I would show everyone that those young brothers and sisters can change,” commented Mr. Ross. “Our children don’t need programs. They need a process that will help them,” stated Enoch Muhammad. Hip-Hop Detoxx is the process that he uses to address the social and emotional issues which have produced the toxic condition that exists in Hip-Hop that are influencing the youth. “I really enjoyed what everyone said. From Freeway Rickey Ross to the guy from the Hip-Hop Detoxx. The girl who performed the poem did a good job also,” stated Glenn Day, a volunteer at the G.E.D. program. Their work in the city of New Orleans concluded with a community meeting at the historical Craige Cultural Center. The event was organized by the New Orleans Peace Keepers, Black Men United for Change and Muhammad Mosque No. 46. The standing room only crowd walked away inspired by Brother Enoch, Brother Arthur and Mr. Ross shared inspirational messages with the audience. The common theme of each of their presentations was their testimony of how great of an impact the Honorable Minister Louis Farrakhan has and is having on their lives. “I am thankful for the brotherhood that I share with Brother Arthur. That relationship made it possible for us to be blessed to have Freeway Ricky Ross and Brother Enoch’s Hip-Hop Detoxx to come to the city. I believe that is important to take advantage of as many opportunities as possible when it comes to bringing enlightenment to our community. The work that these brothers did in the city over the last two days further helps those of us who are working to better our communities here in the city,” stated Nation of Islam student minister Willie Muhammad of New Orleans. Dreamkeepers Award from the Black Heritage Society….I’m honored and humbled.